Luke and Curtis had my heart from page one. 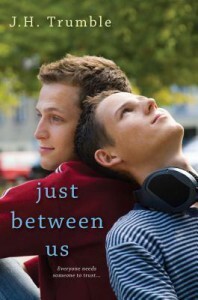 Just Between Us has these beautifully crafted characters that have strengths and flaws making them realistic and making me cheer for them as well as feel right along with them. J.H. has a way of writing relationships that make you fall in love right along with them, and understand their trials, feel their highs, and tingle with anticipation of what will happen next. This is a timely book on HIV, and Curtis is just like everyone else, he made a few bad decisions, but they caught up to him. And it not only drastically changed his life, but the ones of his family and the boy Luke who fell in love with him, and stuck by his side even when he finds out the risk to him and what changed Curtis's life. The medical facts seem well researched but they don't beat you over the head with them, we learn as Curtis learns about it. But if you think this is only an issues book you will be missing out, because at the core, it is a love story. Showing that love doesn't matter race, gender, illness, it just happens. There is a spark, and a lot of tension that preceded their relationship, but I loved every part of it. The stolen words and glances made this semi-slow build and finally into a ignition towards the end. Another aspect about this that I loved was the family involvement. While neither family was perfect or whole, each had one supportive parent, and their relationships with their siblings made the story shine. While Luke deals with his dad who at first is not at all accepting, they later form a tentative relationship, and watching that grow and change as well as Matt's comments to spur their dad on was pretty awesome. I should note there is an age difference. Its only three years but Luke is in high school and Curtis is in college. It didn't bother me because they had things in common and it's like a freshman with a senior to me. There are also some pretty steamy scenes, nothing too left field for the ya genre, but might make some uncomfortable. I personally loved every second of it, and it made me love the story even more. Everything isn't all roses and chocolate between Curtis and Luke, they get in some pretty intense disagreements and they both do some pretty hurtful things to the other, but to me, it makes it more realistic. It is gritty, but I think that all that happens can be chalked up to hurting teens and not knowing how to handle such a huge thing in their life. Bottom Line: Emotional and realistic journey of a young man who discovers he is HIV positive and the one who falls for him regardless.